The rods are living beings, with certain resemblance to insects; they are able to develop astounding vibratory speeds that can take them to supraphysical planes as well as parallel universes. They lack of digestive system and they get their nutrients using solar energy through photosynthesis, as plants do. During the day, they are almost invisible. WHAT ARE THE MYSTERIOUS RODS? 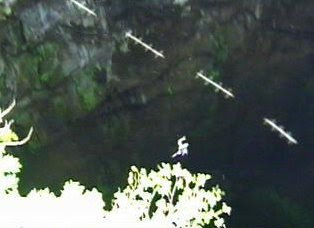 Interlocutor: Now I want to ask you about the Rods or "skyfish" The phenomenon of the rods was discovered in 1994 by the TV producer Jose Escamilla when he was analyzing along with his wife Karen, a series of UFO videos. In one of these recordings, carried out on March 5 of 1994, concretely in Midway (U.S.), they discovered that something stranger crossed the screen swiftly. After the revision and analysis of the tape photogram by photogram, Escamilla reached the next conclusion: what crossed in front of the objective was unknown up to now. Before several media the producer commented: "At the beginning I believed that what passed before the camera were insects or birds. But based on the analyses I carried out and the new videotapes that we have gotten, we are finding many evidences." Ron Hubbard: They are living beings that have the ability to change of vibrational plane. Interlocutor: Are we saying that they can come from parallel universes? Ron Hubbard: They can come from parallel universes and besides, they have the “gift”, to say it somehow, because they are very subtle, to develop tremendous vibrational speed. Interlocutor: Vibrational speed or speed to travel? Ron Hubbard: Not traveling speed, but vibrational speed. Interlocutor: Is it something like the beating of a hummingbird wings? I believe that not even the fastest machine could be able to capture this movement in slow motion. Ron Hubbard: It is something similar. The rods can vibrate at so high speed that they can move to the next vibratory plane 2, the next to the physical plane. Interlocutor: Do they reach the spiritual plane then? Interlocutor: Do the rods have conscience? Ron Hubbard: Yes, but a very basic one, just like the primary animals. Interlocutor: In which Kingdom would it be necessary to classify them? Ron Hubbard: In the animal Kingdom, as insects. Interlocutor: Is their conscience similar to the insects? Ron Hubbard: No, it is something superior. The insects don't have feelings. Let’s forget about the cortex, they are pure instinct. There are animals, in fact mammals that are more evolved than the birds, not only on Earth but in many worlds also. Somehow mammals have feelings. A dog can be sad when his master dies. The rods, I repeat, they are higher than insects, although they don't reach the level of mammals. Interlocutor: Concretely, the rods are living beings. But to which plane do they belong in fact? Ron Hubbard: They belong to the physical plane, but sometimes they increase their vibrations and it is how they can hide in the plane 2. Interlocutor: Do they belong to this universe? Ron Hubbard: Yes, but they can reach, due to their subtlety, to open an interdimensional doors and move to a parallel universe. Interlocutor: There is no doubt that they are very strange creatures, at least for us since we are accustomed to seeing another class of insects. Ron Hubbard: Yes, of course. It is necessary to add that they don't interact with the inhabitants of other worlds. They are completely independent. Nevertheless, they have to do with the vegetal Kingdom, because when they make a kind of transubstantiation, they arrive to the physical plane, for example during the day -with the sun-, they are almost invisible, they rather can be seen at night -, what they do it is some kind of photosynthesis as plants do and they are charged with solar energy. This means that they don’t have a feeding like insects, because they don’t have a digestive system. Interlocutor: Definitely, the rods are, as it happens to all the living beings, a creation of the Elohim. Is it correct? Ron Hubbard: Yes, of course. Except for the Divine Energies, everything that is in the physical plane and the spiritual plane it is a creation of the Elohim. Interlocutor: Do the rods evolve? Ron Hubbard: No, they are precisely strange animals because they don't evolve since they don't have an evolutionary conscience. Interlocutor: Do they have a Superior-self? Ron Hubbard: No, they don't have a Superior self in the spiritual plane, because when they rise their vibrations, they go to the plane 2, but not because they are spirits of Error, but because it is the lowest plane next to the physical plan .That must be understood. Interlocutor: Which would it be the natural habitat of the rods, the physical plane or the spiritual plane? Ron Hubbard: The physical plane, because it is the place where they charge their cells of solar energy through photosynthesis. Interlocutor: Are the rods by chance a recent creation of the Elohim? Ron Hubbard: No, they have existed since the beginning of times. What happens is that they have been discovered recently, because there were not so sophisticated devices to locate them before. Interlocutor: Well, I believe that the topic is clear. Ron Hubbard: I want to add to conclude that the rods do not vampirize, do not absorb, they don't bother, they don't interfere. Interlocutor: Have the scientists discovered what the rods are? Ron Hubbard: No, they haven’t. Does Interlocutor: Is it known what the specific function of the rods is? Ron Hubbard: It is ignored, just like the functions of so many creations of the Absolute are ignored; we don't know why they are here. Interlocutor: Summarizing, to see if I understood: the rods are animals of the physical plane, similar to insects but with bigger conscience. They have a tremendous capacity to acquire a vibratory speed that can transport them to parallel universes or to the spiritual plane 2 and they feed, through photosynthesis of solar energy, in the same way that plants do. Interlocutor: Can they go down to other denser planes, like the -1 (Solitude) or -2 (the Eighth Sphere)? Ron Hubbard: No, they don't descend lower to the physical plane. Interlocutor: Is there something else to add about the rods? Ron Hubbard: Yes. As well as the chameleon is camouflaged changing its color, suddenly if these bugs are bothered or pursued, they escape changing of plane. They go directly to the plane 2 because their instinct tells them that they can be safe there. Interlocutor: The matter about the rods is clarified perfectly. This entry was posted at Monday, May 11, 2009 and is filed under Cryptozoology . You can follow any responses to this entry through the .